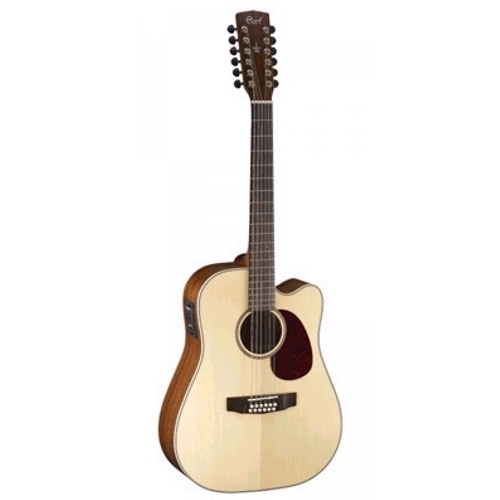 The MR710F 12 is a cutaway dreadnought acoustic electric-guitar with 12 strings and a body made of solid sitka spruce top and mahogany back and sides. It is available in natural satin finish with ivoroid binding and teardrop shaped tortoise pickguard. The neck is made of mahogany with a C contour and a dovetail joint positioned at the 14th fret. The fingerboard is made of rosewood and sports 20 frets with white dot inlays. The electronics consist of a Sonicore pickup and Fishman Classic 4T preamp with on-board controls mounted on the side of the guitar. The bridge is made of rosewood with white pins and plastic saddle.